The designers of YouTube have been busy and given the site's homepage yet another re-jig. They announced the changes in a blog today, and explained that the new look is to "better reflect what's currently popular on YouTube." The three main changes include a streamline of the 'Spotlight Videos', an improved 'Videos Being Watched Now' section and a new 'Most Popular' segment. 'Spotlight Videos' has been streamlined and given greater prominence on the homepage. These videos will eventually be grouped around themes. 'Videos Being Watched Now' has apparently been improved so that it will update quicker and better show the videos that are rising in popularity on the site. 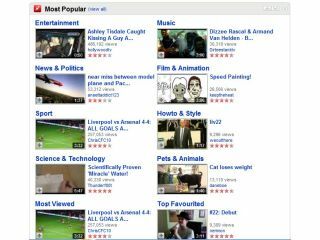 Finally, 'Most Popular' is a new section which is meant to "help surface a wider variety of videos". Considering there is still a 'Most Viewed' and 'Top Favorited' video section, it may just confuse users further who are looking at the site. The blog concludes, saying: "As always, we'll track page usage so we can make sure you're always able to find interesting videos when you come to YouTube." This will be good news to the likes of UK comedian Peter Serafinowicz who commented with tongue firmly in cheek on Twitter today: "Exhausted! Finally finished watching every YouTube video. Some good stuff, but a LOT of crap."